Join us at the Barrick Museum of Art on April 10, 2017 at 7PM for “The Artist as Culture Producer”, an artist panel discussion about the role and impact of visual artists in their communities, beyond the solitude of the studio. This panel marks the Las Vegas return of Minneapolis artist-advocate Sharon Louden, who packed out Trifecta Gallery in April 2014 with an event based on her first book, “Living and Sustaining a Creative Life: Essays by 40 Working Artists” (2013). The Barrick conversation will form part of an international tour for her second book - also named “The Artist as Culture Producer”- which continues the program of artist-written essays begun in “Creative Life”. “Although there is a misconception that artists are invisible and hidden, the truth is that they furnish measurable and innovative outcomes at the front lines of education, the non-proﬁt sector, and corporate environments.” (Louden) Moderated by the Barrick’s Interim Director’s Alisha Kerlin, the panel will feature local artists Andreana Donahue, and Justin Favela, and Wendy Kveck, alongside Louden and New York painter Clarity Haynes. The audience will be invited to join in a lively assessment of the ideas raised by the book. A public reception and book signing will follow. Multidisciplinary artist Andreana Donahue is co-founder and director of Disparate Minds, an interdisciplinary project which highlights and discusses the work of marginalized self-taught artists, inspired and informed by her years of experience as a practicing artist, facilitator, and dedicated disability rights advocate. Donahue directed her downtown Las Vegas gallery, Main Gallery, from 2007-09 . The Las Vegas based artist will appear in the Barrick’s 2017 Summer show, Tested Ground. A Las Vegas artist whose work has appeared in museums across the country, Justin Favela is also the gallery director and curator of Clark County Visual Art Galleries. As co-founder of the popular podcast Latinos Who Lunch, he is an experienced debater and raconteur with a serious interest in the refraction of identity politics through the lenses of pop culture and current events. Favela’s art is a celebration of his life as a Nevadan of Guatemalan/Mexican heritage. Clarity Haynes is a feminist painter, writer and educator living in New York City. Her Breast Portrait Project is a multidisciplinary, socially engaged work that is grounded in the practice of painting from observation. She teaches drawing at Brooklyn College and painting at Trestle Gallery, and is a member of the Corpus VI art collective. She recently launched a new podcast featuring studio visits with artists, Magic Praxis. Artist Wendy Kveck has worked in Las Vegas with the non-profit Contemporary Arts Center, with city outreach programs, and as an arts educator and advocate. She is the founder and editor of Settlers + Nomads, a curated website featuring a presentation and discussion of contemporary art between local artists and artists with ties to Las Vegas. 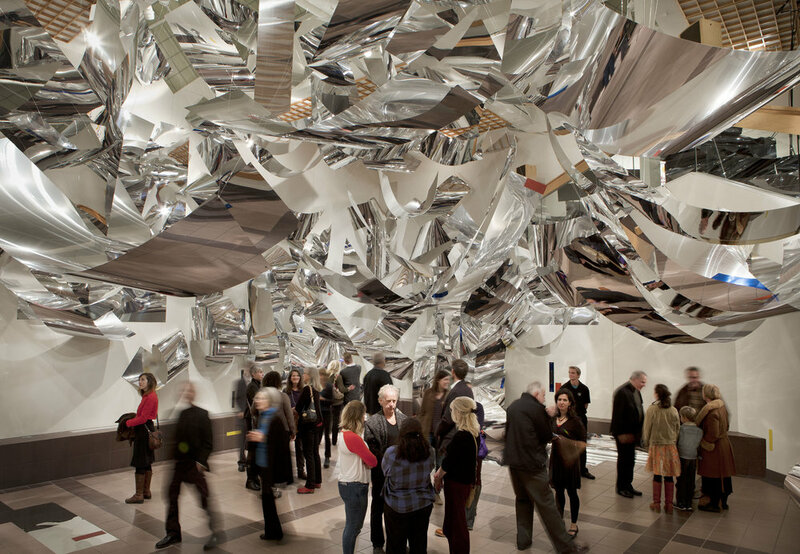 A retrospective of recent work appeared at the Barrick Museum in 2015 as part of the three-artist exhibition, Kveck, Russ & Stellmon. Sharon Louden is an artist, educator, artist advocate, and editor of the book series “Living and Sustaining a Creative Life.” A consultant for the Joan Mitchell Foundation and Senior Critic for the New York Academy of Art, she is active on the boards of numerous not-for-profit art organizations. Her work appears in the collections of the Whitney Museum of American Art, National Gallery of Art, Yale University, and the Museum of Fine Arts, Houston. 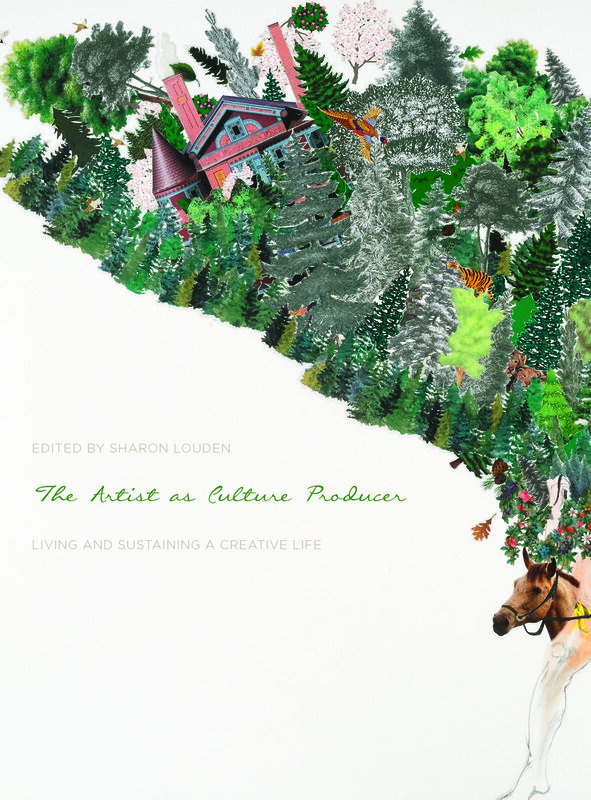 "The Artist as Culture Producer: Living and Sustaining a Creative Life," Edited by Sharon Louden, published by Intellect Books, distributed by the University of Chicago Press. 402 pages, 2017. Title image: Sharon Louden, "Windows" at the Tweed Museum, ceiling installation, monofilament, steel screws, glue. 2015-2016.